Apple on Sunday instituted a new junk content reporting feature on its iCloud.com web portal, the first step in what appears to be an activation of countermeasures against iCloud Calendar spam invites users began to receive in volume last month. 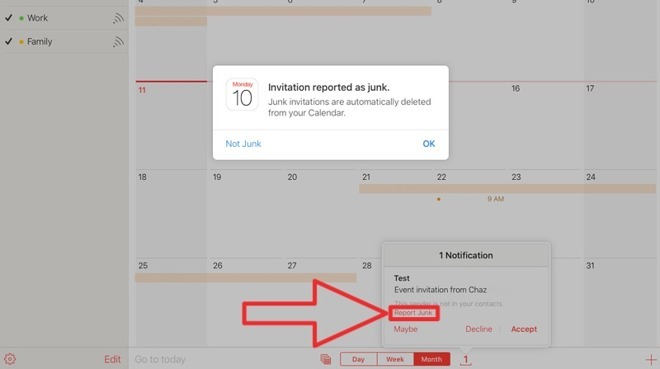 As seen in the image above, iCloud users are now able to report Calendar invites from unknown senders as "junk" by clicking on a hyperlink in the iCloud.com web interface. The provision to mark an invitation as spam, which appears inline with accept, decline and "maybe" options, is currently limited to iCloud.com, though a similar feature could make its way to dedicated iOS and macOS Calendar apps in the near future. With junk reporting now in play, Apple is presumably creating a database of nefarious users who will be monitored and, if necessary, blocked from sending mass spam invites to other customers. While the Calendar event invite mechanism has long been available to Apple device users, it was only last month that marketing trolls began using the capability en masse to push out advertisements. The scheme is simple, yet effective. By shuffling promotional content through Apple's Calendar service instead of sending out the usual email blast, spammers effectively bypass email client junk filters and, depending on a user's system settings, trigger a push notification on their target's iOS device or Mac. As an added benefit, any user who interacts with an iCloud Calendar invite —accept or decline —automatically sends a response to the sender, allowing spammers to easily determine which accounts are active. Apple acknowledged the problem in a brief statement, apologizing to those affected and promising to fix the issue by "identifying and blocking suspicious invite senders." That was nearly two weeks ago. Prior to the implementation of today's tool, users had little recourse but to ignore the invites, turn off Calendar notifications or undertake the arduous process of creating a dedicated junk calendar, moving spam to said calendar and deleting it. Doing so removes the offending invitation without tipping off the spammer.